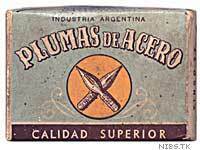 »PAL  Peso Pluma, Industria Argentina, 10 Hojas de Afeitar  Vintage Argentinian Razor Blades. »Calígrafos de la Cruz del Sur  Agrupación de Calígrafos Argentinos. »Plumero  script font by Argentinian designer Diego Giaccone is available from Sudtipos foundry. 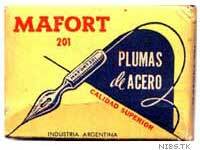 There are no steel pen makers in Argentina today. The old nib boxes are from eBay auctions. Argentinian nib collector and cartoonist Fernando Martello from Buenos Aires provided information and nib scans. These nibs are not for sale. All of them were produced in my country, about 40 years ago. I don't know exatly the year of manufacture, but these were used by my mother when she was a school girl, so they are really old pieces!" 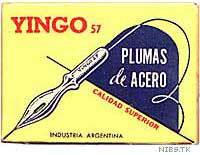 "Este es el sitio dedicado a las plumas fabricadas en la Argentina, las famosas »cucharita«. Espero que muchos otros fans puedan acercar sus contribuciones para que esta página siga creciendo en contenidos." 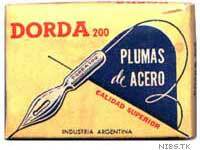 »Looking for pens from Latin America?  Check out Mercado Libre auctions from Argentina, Brasil, Colombia, Chile, Ecuador, México, Uruguay and Venezuela. Plumas de Acero, Yingo, Imsa, Redis, Nitor, Massag, Kendall and Heintze & Blanckertz Alligator. All images, characters, logos and trademarks are property of their respective owners and are used here either with permission or in an editorial fashion only. Content on this site is �1999-2004 BLAM®. Hans Presto is a Swedish lettering-artist and art-teacher. BLAM design supplies new and vintage steel pen nibs (pen points) to Scandinavian cartoonists and calligraphers. This web site is not affiliated with the pen makers in any way. This is an independent site containing information about pens and calligraphy tools.